Yeah, okay, enough's enough. Obviously I need someone who KNOWSEVERYANGLE. If you throw out "straight" for your basic 180° angle, the remaining four are represented in shaded squares in each corner of the grid. So, by the way, as opposed to Monday's circles, here is an example where you absolutely need the shaded squares to find the hidden angles. On the other hand, having figured out what was going on with the revealer, I was able to put the angles in place, making each corner easier. Well, almost every corner. I forgot what a reflex angle is. Anyway, with these hidden words comes triple-checked letters: that is to say, each letter in the angle names plays a role in three different answers, rather than two as is usually the case. What this leads to is a spattering of less than ideal fill (I'm looking at you, ALINED! ), mostly because crossings no longer can fit in the usual pattern of English usage. I think Mr. Perl does a reasonable job of avoiding the worst of it. But look in the area around "obtuse" and you'll see what I mean. ROBT, ATT, NSFW, UNS. These were made necessary by the triple checking. It also allows for some fun stuff like NBADRAFT. 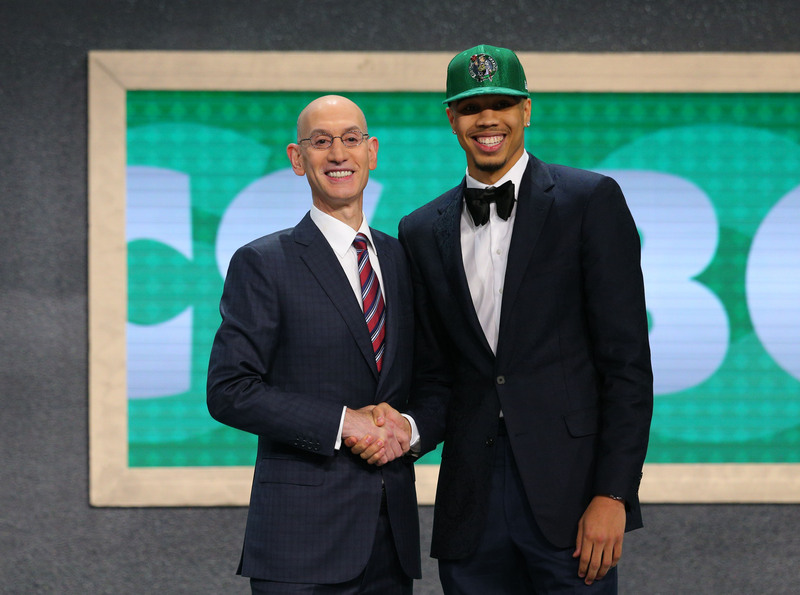 Jayson Tatum's been pretty awesome this year! Finally, it would be GRATUITOUS of me not to give a side-eyed look at LEX. We lived a block or two away from the 4-5-6 for five years, and ATNO time did anyone I knew call it that! I'd never heard of LEX, either; not that I've had as much exposure to the system as Colum, but I've certainly been on it quite a bit. I love an angle, and am, indeed, a math major, but also did not recall ever knowing of a REFLEX angle. And ALINED stuck in my craw as I was forced to enter it. We all love a PIROGI, too, but we're more accustomed to the "pierogi" spelling, and in fact, have never seen the former. Was the theme worth all of the junk? I'd come down on the side of yes, only because it's math-based. Otherwise it'd be a NOGO.